Doagh motocross star Martin Barr will race for the Buildbase Honda team in a four-man line-up next season after signing a last-minute deal with the British Championship set-up. Three times world champion Dave Thorpe, the team’s owner had tried to sign the 28-year-old in the summer but at the time he was happy to stay with his existing set-up. However, his persistence paid off when Barr agreed a deal. After testing the 2016 CRF250R last week, the East Antrim rider is confident he has made the right decision. “I’m really looking forward to racing with the Buildbase Honda team,” said Barr. “They’ve put a really good deal together for me. It’s one of the most professional teams in the paddock and I’m very excited to be part of it. Barr will race MX2 for Buildbase Honda alongside Lewis Trickett. 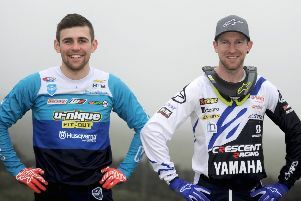 MX1 duties will be handled by former British champion Kristian Whatley and Carrick’s Graeme Irwin. After racing in MX1 last season will it be a big change to ride the MX2 machine? Team Manager Neil Tuxworth said Barr has the potential to win the MX2 title and the local rider is relishing the prospect of gettingto grips with the bike when he heads for Europe in the New Year. “I go to Spain in January for 14 days, then off to Italy for the Italian Championship. It will be nice to get a few races under my belt before everything kicks off,” he added.